​I have translated into English, Master Wang’s original Chinese language blog article entitled ‘ 太极拳内在的东西’, or ‘Taijiquan Internal Training Specifics’, referenced below. Master Wang’s Chinese language Taijiquan blog can be referenced freely at the link provided at the end of the translation, where he shares his wisdom and knowledge with the general public. This article gives a direct insight into how ancient martial principles are conveyed within modern China, and how the wisdom of the sages is made ‘relevant’ for a new generation. That which is tangible and easily experienceable, comprises the material world – this is termed the ‘external’ (外 – Wai). This includes the human-body which is comprised of muscle and bones, ligaments and tendons. Another way of referring to the material world is that it is primarily ‘positive’ yang (阳) energy. Although we can train for a very long-time – moving the body through various martial routines – and clearly perceiving the nature of the movements (which anyone can do), this is no substitute for the profound insight offered to us by a qualified teacher, without which, we will not be able to see through the fog of ignorance. However, genuine knowledge of the ‘internal’ (内 – Nei) has been developed over thousands of years, and is not easy to understand, penetrate, or encounter. In my view, it is impossible to attain to these higher levels of Taijiquan without a fully qualified teacher. This is because precise guidance is required every step of the way, with no deviation from the correct path of (generating) and balancing units of pure yin (阴) with pure yang (阳) within the correct technique that successfully cultivates the Dao (道). This ability must be taught to us by those who have already trodden this path, and authentically attained its fruits (of longevity and robust health). Although certain aspects of the foundation of Taijiquan training can be attained through self-study (through such methods of learning from manuals, DVDs, or copying others at a distance), the fact remains that a qualified teacher must clearly demonstrate the correct path in a manner that is relevant to the deepest aspects of our psychology and physiology – as generalisms in this area simply will not work. For instance, what is the relationship between ‘intention’ (意 – Yi) and ‘thought’ (念 – Nian)? How are these concepts connected to ‘mind’ (心 – Xin) and ‘spirit’ (神 – Shen)? How do the ‘nerves’ (神经 – Shen Jing) affect the internal organs (内脏 – Nei Zang)? Although in the early stages our perception can see the outer body, it cannot properly discern the inner terrain of the mind and body (which must be shown and explained to us by a competent teacher). Therefore, when practising the movements of the Taijiquan form, we must pay attention to the interaction of yin and yang. This awareness then integrates with, and directs the ‘rooted’ martial movements, which move left and right, up and down, and side to side, without balance and alignment being lost at any point in the technique, or string of techniques. The awareness of the ‘closed fist’ (拳 – Quan) is constant and never broken. At the highest level, this attainment of insight is marked by an experience of an ‘expansive conscious awareness’, which is ‘empty’ in nature (虚灵 – Xu Ling). This process generates ‘strength’ (劲 – Jin), when expansive consciousness (bodyweight and breath) are ‘dropped’ or ‘sunk’ (沉 – Chen) through the legs and feet into the ground – where a rebounding force manifests (and distributes throughout the torso and limbs). The essence of the mind is not found in the external body, but rather is found permeating the entirety of the inner body. Shallow perception thinks the hand (手 – Shou) moves itself, but deep awareness reveals that the hand is in fact moved directly from the lower energy self-cultivation centre (丹田 – Dan Tian), facilitated by a developed ‘intention’. In reality, all outer movement of the body originates entirely from within. We usually say that the ‘divine sky’ (天 – Tian) represents the ‘macro-cosmic orbit’ (大天 – Da Tian) – or the entire physical universe and its energy flow, whilst the ‘human body’ (人 – Ren) represents the ‘micro-cosmic orbit’ (小天 – Xiao Tian) – and its enclosed energy flow. The ‘divine sky’ contains the ‘three treasures’ (三宝 – San Bao) of the sun, the moon and the stars, whilst the broad earth (地 – De) contains the ‘three treasures’ of the water, fire and wind. The human body contains the three treasures of ‘spirit’ (神 – Shen), ‘vital energy’ (气 – Qi), and ‘essential nature’ (精 – Jing). When we practice the Taijiquan form, we must train very hard and work on understanding and perfecting the ‘internal’ method of martial arts practice. This is how the Dao of internal health is developed, which is not dependent upon any form of externality. A human-being consists of the ‘divine-sky’, and the ‘broad earth’ – both of which are fundamentally integrated with the essence of humanity. When the mind (and body) are not developed, and ignorance defines reality for the individual, then the ‘greater’ aspect of existence remains unknown. When the mind and body are purified through self-cultivation, then the ‘greatness’ of this integrated existence is realised in the individual, and manifested here and now. This means that the ‘inner’ being is fully aligned with the ‘outer’ universe, in perfect harmony with the ten thousand things. However, this process begins with harmonising the inner being by relaxing (and co-ordinating the physical body), whilst calming, relaxing and focusing the mind, through self-cultivation. When ‘intention’ is used correctly, the mind is ‘stilled’ before expanding and embracing the divine-sky and the broad earth. This is how personal consciousness expands and is realised to share the same essence as the universe. This is the integration of the micro and macro-cosmic orbit circulations. In the deluded state, the fundamental integration of the divine-sky and the broad earth remains unknown. In the enlightened state, this obscuring layer of ignorance is ‘dissolved’ and the universal reality of diversity within oneness is directly understood. There is a Buddhist poem which states that many spend their time looking for ‘Spirit Mountain’ (灵山 – Ling Shan) by travelling here and there in the external world, when in reality, ‘Spirit Mountain’ resides only deep within the inner mind – here and now. A ‘Spirit Mountain’ resides in all beings, and denotes the inner (and outer) path of self-cultivation that we must all undergo to realise enlightenment. Through the physical activity of Taijiquan (太极拳), the mind (and body) is slowly purified (of all negative energy), and robust health, longevity and understanding manifests. The important point is that Taijiquan practice, despite the fact it involves a set of physical exercises that defines its existence, is in fact more properly categorised as being a martial art that is better described as a ‘Wisdom Fist’ (智慧拳 – Zhi Hui Quan), or a ‘Knowledge Fist’ (知识拳 – Zhi Shi Quan). This is because the physical movements are moved consciously by the mind and directed by the ‘will’. This is how self-cultivation is performed through Taijiquan practice – mind-led physical movement. This is a purification process that must be performed everyday (as if attending a meditation hall designed for Daoist self-cultivation). If carried-out correctly, then the goals of attaining longevity, robust health and wisdom become ever closer. Qi (气) energy and blood (血 – Xue) flow in harmony together, when guided entirely by the use of the ‘intention’ (意 – Yi), which is the product of appropriately focused thought (思 – Si). This is attained through self-cultivation that develops the mind and body in harmony. This is encompassed in the Daoist concept of ‘性命双修’ (Xing Ming Shuang Xiu), or the Essence of Life – ‘Mind-Body Self-Cultivation’. This concept is applied through martial (武 – Wu) training, where the profound penetration of the state of ‘stillness’ (静 – Jing), is combined with an equally profound penetration of the state of ‘movement’ (动 – Dong), which is attained through a disciplined adherence to the long-term practice of Taijiquan, which co-ordinates a smooth and rhythmic interchange of ‘stillness’ and ‘movement’ in the body, and attains a deep and profound ‘stillness’ and ‘calmness’ in the mind. This relaxes all unnecessary tension from the musculature of the body, allows the joints to align, and the qi energy and blood to flow freely through the body energy channels. The mind’s awareness expands and encompasses all things with an impartiality that cannot be shaken into the confusing state of duality. Within movement, there is stillness, and within stillness, there is movement – with no contradiction or departure from this harmonious manifestation. This is how spiritual enlightenment and profound health is attained. The ‘intention’ and qi energy unite into a permanent oneness of awareness that cannot be broken. Wherever there is ‘intention’, the qi energy flows freely. This internal self-cultivation relies upon the ‘stilling’ of the mind, whilst the body is engaged in martial movement. When this perfect state of harmony is attained, then there is no paradox or contradiction. To learn the basics of a Taijiquan ‘frame’ (架 – Jia) is a relatively easy matter, but to develop and change that ‘frame’ is very difficult without expert guidance. In some schools, entire forms can be learned in a shallow manner in just three months, but this amounts to no real acquisition of authentic knowledge or understanding. In reality, three months of training should be spent learning and practising each movement, whilst fully penetrating the obvious and the hidden meaning contained therein. If you are sincere in your training, are diligent and hard-working, and have access to good instruction, then you may gain in 5 years, a strong foundation whilst practising the ‘Big Frame’ (大架 – Da Jia), however, if you are not sincere, are not hard-working, and do not have access to good instruction, then even after 10 years of practice, you may not even master the basics of the ‘Small Frame’ (小架 – Xiao Jia). Within a good school that possesses competent teachers, the ‘Big Frame’ may be practised for 10 years before a basic understanding is acquired, but this is the establishment of the foundation only. A good teacher will correct where correction is necessary – even to the point of physical punishment – and will not shirk this responsibility. This is because our ignorance can be very strong and difficult to transcend in the early stages, and that Taijiquan is a ‘hands on’ activity. The student must be guided by a good teacher, as this is the only way in which the ordinary can be transitioned into the extraordinary. Every step must be demonstrated in person by a teacher who has already trodden the path, and understands all the potential pitfalls. As this is the case, I would say that 90% of Taijiquan practice seen in the park is in fact merely a gentle form of gymnastics, and has nothing to do with advanced Taijiquan theory and practice. The movements of Taijiquan must be a profound physical manifestation - as if carved out of ‘essential nature’ (精 – Jing). Without the retainment and strengthening of ‘essential nature’, there can be no genuine Taijiquan practice – as the postures will lack inner integrity and strength – and serve no profound or virtuous function in the world. To understand the context of Taijiquan practice as an ‘internal self-cultivation’ (内功 – Nei Gong) art, it is probably beneficial to briefly examine the other two martial arts generally included in this category, namely ‘Xingyiquan’ (形意拳), and ‘Baguazhang’ (八卦掌). These three martial arts are also known as ‘Internal Family Fist’ (内家拳 – Nei Jia Quan), as their respective training methods emphasise or recognise the importance of cultivating ‘essential nature’ (精 – Jing) as a means to build inner strength through practice. If ‘essential nature’ is not retained and strengthened, then the training becomes pointless and counter-productive. In fact, these three arts, despite their distinct histories and different techniques, all share a similar approach to inner training, with differences in emphasis and direction. This suggests a difference in style when training to build (and manifest) ‘original inner strength’ (元劲 – Yuan Jin). However, whereas Taijiquan emphasises a ‘deep’, ‘soft’ or ‘pliable’ (柔 – Rou) strength, ‘Xingyi’ practitioners train to develop great ‘hard’ (刚 – Gang) power, whilst Bagua utilises the principle of power produced through ‘twisting’ and ‘turning’ (旋转 – Xuan Zhuan) the torso and limbs. This is an interaction of both ‘hard’ and ‘soft’ that creates energy through ‘torque’ generated by twisting the muscles, ligaments and tendons around the bones and joints – before ‘releasing’ through different postures and techniques. A very interesting and profound aspect of the Taijiquan method involves what is termed ‘rounded strength’ (浑圆劲 – Hun Yuan Jin), which is the primary method of gathering, building and cultivating essential nature, qi energy (jing), and spirit (shen) – with ‘spirit’ (being conscious in nature) guiding the entire process. Obviously, this method is very subtle and difficult to learn, and is not for the average person, who generally seeks unity with the external environment only (i.e. with the triple factors defining the divine-sky and the broad earth – but omitting the ‘internal’ triple factors of the human realm). 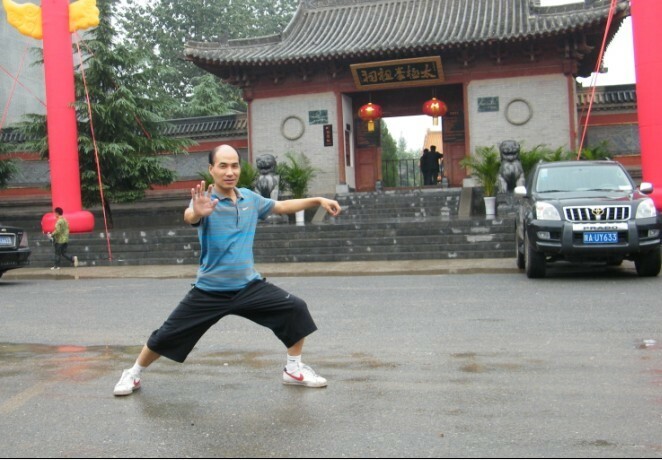 An obvious question asked by many, is how to practice Taijiquan for self-defence? Many assume that if they practice for year after year the movements of the form, the joints will become profoundly rounded, relaxed, naturally resisting, and supple, whilst the bodyweight will move freely around the frame in a permanently rooted state, whilst the mind is calm and expansive. Is this assumption correct? It is only correct if you have a teacher who ensures that your practice is progressing correctly, and all the required attributes are developed at the right time and in the correct manner. If you just ‘play’ at Taijiquan, and aimlessly move your body about every morning, none of these advanced attributes will manifest – how could they? If you do not develop a very strong (but relaxed) sense of ‘buoyancy’ and ‘resistance’ throughout the joints of the body, then even if you train for many decades, no genuine martial ability will manifest. You must be ‘shown’ how to achieve these attributes by someone who already knows – as this is a sign of an authentic lineage. The important point to remember, is that internal self-cultivation is the product of specialised knowledge that cannot be ‘guessed’ at. Such an important undertaking requires definite and precise stages of correct training that does not deviate from the ancient ‘law’ (法 – Fa) that governs the acquisition of such skills. This includes a sense of ‘buoyancy’, (experienced throughout the joints) which might be better described as a ‘relaxed-tension’ (松紧 – Song Jin) that permeates the entire body from a well-grounded ‘rootedness’. Concomitant with this attainment, is that of a permanent and perfected ‘balance’ (平衡 – Ping Heng) that is never disrupted or broken. This is how a ‘true stability’ (真松 – Zhen Song) is cultivated, that like a great tree, cannot be blown-over in a gale. Merely practising the Taijiquan form in a directionless manner, will not acquire any of these skills. This is the same if Taijiquan practice is superficial, half-hearted, or only ‘lightly’ practised, as there will be no true stability, health improvement or martial benefit. If the sense of ‘stability’ is achieved, then it will possess the two distinct factors of ‘heaviness’ (膨松 - Peng Song), and ‘lightness’ (蓬松 – Peng Song), states which should not be mistaken with ‘weakness’, or ‘non-effort’. This is all dependent on realising the presence of qi energy flowing throughout the body and around the skin. Its presence is felt in the joints which become ‘strong’, ‘flexible’ and ‘buoyant’, as it flows throughout all the body’s energy channels without hindrance. In fact, by focusing the mind, expanding the awareness, breathing deeply, aligning the bones and joints, and relaxing the musculature, the entire body feels like a ball of skin inflated with (buoyant) qi energy. If external pressure is exerted on one point of the body, the qi energy in that area will subtly give-way to a certain extent, and re-distribute to other areas (thus absorbing the incoming power), whilst maintaining the over-all integrity of the body defence. Therefore, if external pressure is exerted on your hands (as in posture testing), the hands do not resist, but your entire body simply ‘adjusts’ in a very powerful and devastating manner that is difficult for an opponent to discern. The incoming power is ‘deflected’ back into the attacker’s limb with no undue effort. As the bodyweight drops into the floor through the lower energy self-cultivation centre (two inches below the navel), then the re-bounding force this generates will be ‘emitted’ through the same ‘dan tian’ centre, and will be directed through the legs, waist, abdomen, spine and limbs – discharging a massive amount of force with no undue effort (usually in a ‘rolling’ or ‘wave-like’ manner). Through continuous internal self-cultivation, internal strength is developed during Taijiquan practice throughout the entire body. At the beginning, when the bodyweight ‘drops’ into the ground (through an aligned bone structure), there is a sense of ‘heaviness’ that is not yet moving (like a steam-train resting on the tracks), but as the body begins to move through the Taijiquan postures (directed by the ‘intention’ and the ‘will’), this ‘heaviness’ moves (like a steam-train travelling on the rails) with no effort once the correct rhythm and momentum is achieved. This simultaneous sense of ‘heaviness’ and ‘lightness’ is combined with an expansive ‘buoyancy’ that is resisting to any external force applied to the body of the Taijiquan practitioner. This is dependent upon realising that the body feels as if it is ‘suspended’ (挂 – Gua), or ‘hanging’ in the air, despite the fact the feet are in contact with the ground. This is the product of the spinal column being ‘extended’, with the arms and legs ‘hanging’ from the shoulder and pelvic girdles – with the head ‘floating’ upon the neck. The body moves in a co-ordinated manner with no breaks in rhythm or momentum. This realisation of a sense of ‘unification’ permanently replaces the beginner’s sense of disjointedness. At this stage, the bodyweight drops down through the centre of the bones into the ground (with the re-bounding force travelling back-up toward the head), strengthening and hardening the bones by stimulating the bone-marrow. The bodyweight drops – creating a sense of ‘heaviness’ – and with the re-bounding force travelling upwards – a simultaneous sense of ‘lightness’ is present. In this state, a Taijiquan practitioner can move freely in any direction with great power and relaxation, whilst at the same time remaining completely ‘rooted’, so that it is very difficult for an external force to ‘uproot’ the Taijiquan practitioner. This means that the Taijiquan practitioner can ‘emit’ tremendous force at any moment, gathered from the alignment process that does not require any recourse to external methods of power generation, which lack fluency and profundity of awareness and technical skill. The internal method of great power generation is constant and never-ending, and is obvious in the fore-arms – as the Taijiquan form unfolds. The awareness of the ‘bones’ and their function become most evident at this stage, with a clear distinction between bone and flesh. Those who practice only the ‘external’ method, do not comprehend this method, or understand how a Taijiquan practitioner remains both calm, fluid and powerful. The central process for this realisation is that of ‘aligning’ the bones and joints. Although a physical reality, such an advanced state of being is dependent upon a new interaction between the mind and the body, and is the product of an expansive awareness. All the joints – although distinct and discernible – are nevertheless ‘united’ and ‘buoyant’ through bodyweight channelling and the re-bounding force. The disparate joints move together in a unified manner that cannot be disrupted. The body is both ‘strong’ and yet ‘flexible’. The tendons are ‘taut’, whilst the muscles are ‘relaxed’. Those who do not penetrate this understanding, do not progress beyond the external method of practice, as this stage is very difficult to understand and achieve. However, those who do progress, experience a much more rooted, co-ordinated and smooth method of powerful internal practice. The reality is that if this level of attainment is not personally experienced, its attributes simply cannot be understood. A training analogy could be that of practising weightlifting, where after a specific time of activity orientation, the weightlifter becomes acutely aware of the bones and the muscles, and how these two parts of the body are connected and interact before, during and after a weightlifting exercise. This includes how the large tendons and muscle-mass generates power, how it energises and diminishes in strength, and how lactic acid builds – which must be removed through rest, further movement and manipulation, etc. The shoulders, arms and hands are empowered through this technique, and after perhaps 3 years of regular practice, begin to intuitively understand the exercise regime and the correct technique required to perform it. This demonstrates the relationship between ‘practice’ (练 – Lian), and ‘supportive self-cultivation’ (养 – Yang), where correct physical practice strengthens the mind, and builds awareness and understanding. As training progresses, the ratio relating the good practice of physical Taijiquan technique, to that of the self-cultivation training that produces it, is around 3 units of perfected technique, which is generated by 7 units of good preparatory training (or around two-thirds of training time effort results in one third of perfected practice time). Obviously, if the equation is reversed (and poor training technique dominates the entire process), this leads to a permanent deficiency in attainment, and no progress can be attained – regardless of effort exerted. Eventually, of course, when everything becomes ‘centralised’ and ‘stabilised’, every moment of training becomes equally physical, psychological and spiritual – in the sense of ‘transcending’ ordinary levels of understanding and practice. The body moves freely (but in a co-ordinated manner) within a state of permanent conscious expansion. Awareness develops to such a subtle and refined level that it is able to perceive qi energy flow, blood flow (and the difference between the two circulations), and how these circulations differ from the bone and flesh they travel through and around. The body (and joints) feel ‘buoyant’ (like an inflated balloon), with a complete unification between the ‘inner’ and ‘outer’ aspects of reality, mediated by a mind that is calm, empty of deluded and discriminating thought, and all-embracing (as if the physical body and the world appears within the mind’s awareness). Not only this, but a state of continuous ‘enjoyment’ permeates the mind and body (like listening to sweet music filling the air). The ‘intention’ of the mind is fully aware of ‘form’ and ‘void’, but does not limit its awareness to either state – it remains non-attached to all states whilst guiding the body through the Taijiquan movements. The body is experienced as if it is like a soap bubble – light as a feather – easy to move, precise in its positioning, and able to generate great power at a moment’s notice. As a perfect blend of form and void, the body is perceived as if it no longer possesses a crude physical presence. If there is any rash movements during the Taijiquan form, it feels like the soap bubble might burst – causing a technical disaster of the loss of alignment – but this can be avoided by careful and exact placement and movement. Taijiquan practice is the attainment of subtle conscious awareness and a perfected physical presence in the world. On a practical level, Taijiquan draws its internal power and stability not from the muscles, but rather from the bones and tendons. As regards to one’s attitude toward martial arts practice – do not be superstitious, or get involved in arguments about which style is ‘better’ or ‘worse’. This is nothing but pointless psychological ‘clutter’ in the mind that can interfere in the efficiency of Taijiquan training. Yes, it is true that each style possesses its own strengths and weaknesses, but these are to do with the historical and environmental conditions within which they were developed. To understand these conditions does not necessarily require an adherence to a dogmatic point of view. When martial arts are propagated throughout society for the benefit of the people, then a diverse approach is best to meet all the different practice requirements (such as age, gender, ability, disability, illness and injury, etc). Some will participate in competition when young, but most will not. Some train for self-defence, whilst most train for health – all these objectives must be accommodated. However, as to my own point of view – which is premised upon my own life preferences and experiences – martial arts such as Muay Thai or Taekwondo have very limited objectives premised upon pointless and short-lived egotistical ‘victories’ over other human beings, and do not accommodate long-term health building, or any profound ‘inner’ self-cultivation. For me, this approach to training is one-sided, youth-orientated, and very limited in scope. When the entirety of the scope of ‘internal’ martial arts is assessed, then modern combat sports are like a form of ‘castration’ (阉割 – Yan Ge), where the ‘true essence’ has been cut-away, abandoned and ignored. These are not the best martial arts, but only appear dominant within their own particular historical and cultural conditions – change those conditions and these arts become ineffective, or radically inefficient. My advice is to choose a martial art style that best suits your current needs that propagates peace - with the caveat that you should start training today, to prepare for old age tomorrow. If your intention is merely good health and self-defence, then you must practice an art correctly and learn how to ‘transform’ and ‘transcend’ the ordinary into the extraordinary. This takes good guidance and instruction. However, if you wish to ‘inherit’ (传承 – Chuan Cheng) a martial arts style, then you must not only master its technique today, but you must also learn precisely how the style first developed, its history of evolution, its various masters, and all its peculiarities. You must also learn how to preserve the ‘inner core’ of this style, retaining all its traditional elements, values and methods, whilst simultaneously making these old ideas relevant for the modern age.